The Tuff Rider Men's Baroque Dress Boot is made with super soft premium leather, these boots offer elegance and traditional styling of a custom made boot. Tuff Rider Men's Baroque Dress Boot is rated 3.8 out of 5 by 12. Rated 5 out of 5 by Joe58 from Great boots for a large man It’s very difficult to find boots for a man. Thank you! Rated 5 out of 5 by Marek from Great price and comfort Just got them and used twice. Very comfortable and fit like a glove. While on the horse first time using the boots you do not feel like wearing something awkwardly new; you just use them for aids not thinking about your purchase. Rated 5 out of 5 by Juju from Excellent Great boots. They fit well. Also great customer service. Rated 5 out of 5 by q101052 from great boot for the price I had bought a pair a year ago for my husband and he really loves them and they are holding up very well. However, our 14 year old son then started borrowing them so I had to get my husband a new pair so my son could own the old pair and they would stop fighting over them. Rated 4 out of 5 by emipou from super stylish & comfy I was in a tight squeeze to find an affordable tall boot to fit my unique sizing and found these boots! They were broken in out of the box! I love them. Since they are pretty soft leather, I've been keeping them clean and only wear them while riding (4-5 days a week). They are still in great shape! Love the inflatable boot trees too! Rated 1 out of 5 by Buddy from Good looking; overall nice quality Purchased these boots and due to a insert worn by the owner, we are ordering a 1/2 size larger to see which fits the best. Not a problem of the boot, but of the purchaser. Insert is only for one foot. Rated 4 out of 5 by VBaker from Easy break in! I bought these for my 13 y.o. son for his upcoming rated Dressage show debut. He is thrilled! He was very picky and didn't like the stiff boots he had tried on locally. These are very soft leather and they broke in quickly. He never got blisters and he said they are very comfortable to wear. The pull tab on the zipper broke off in the first try, but TuffRider isn't high end, so I sort of expected little flaws. Sizing - my son wears a 10 1/2 mens running shoe and the 9 1/2 boot fits perfectly. There is no support in the food bed, so we inserted an athletic memory foam insole. The calf is very large on his skinny boy legs, but the boot still fits at the top, so no one will notice when he is riding. Rated 4 out of 5 by Freckles09 from Quality and service I bought this product about 3 weeks ago. Delivery was quick and the boots broke in nicely. Rated 2 out of 5 by BenB from They will get you by I have huge feet and when you are in this situation, you are limited to low variety of commercial boot products, or custom boots. These will get you by, but the quality is just not there.... It's disappointing to open the boot box and smell chemical fumes and not leather. They are leather, I think, but it's low quality. The shafts are thin thin... The zipper and elastic feel like they will break/rip just by thinking about pulling the zipper up. But they do look nice and they do fit my Sasquatch size 13 man foot, so I can't complain much considering the price. If possible, avoid these, unless you have no other option. Rated 4 out of 5 by Chipper from Great price for a tall show boot. Follow up from the previous review - I'm 6ft3 and the height of the boots is perfect for me, which is very rare especially for a stock regular height boot, so that was a great surprise! 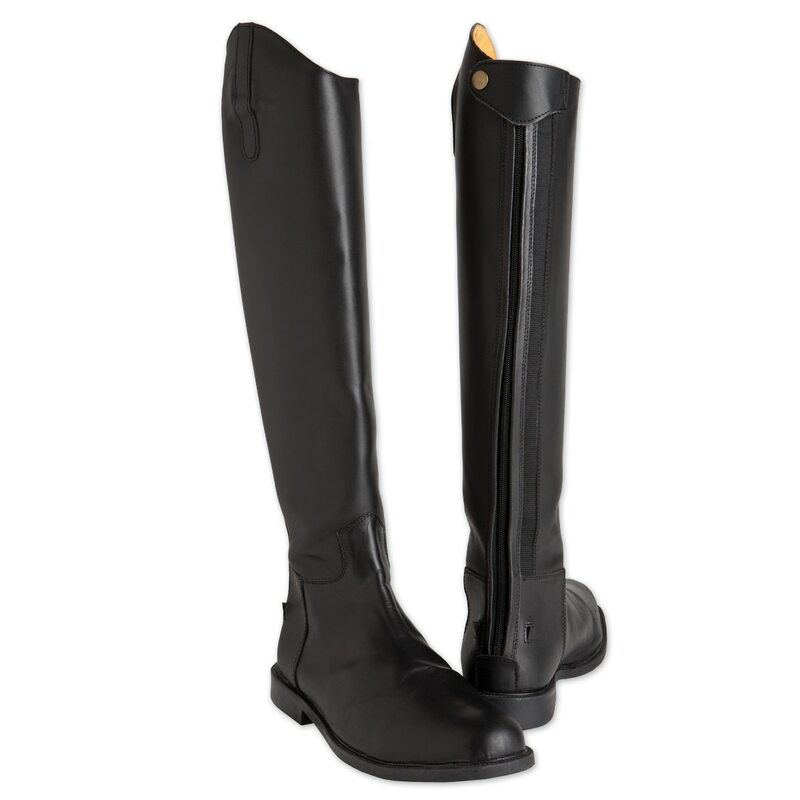 I bought these as a general schooling and trail riding boot. The leather is very soft and supple, which I was no expecting from the pictures. This great for comfort but I do doubt as to how long these will last me, especially as I do frequently ride through rough terrain and brush. My conclusion is that I would recommend these as a great show boot for those who compete - not so much for people who do a lot of work/strain on them where a thicker more heavy duty leather would do better.